I have often considered what my life would be like where it not for the good people past and present at Penguin. This wonderful publishing company has, for so many years brought realistically priced paperbacks to an audience who might well have never normally had the chance to read many of the classic works which they have reprinted. So it is in this regard that yours truly welcomes with open arms the two classic novels by Jean Lartéguy published by Penguin Classics. Jean Lartéguy, the nom de plume for Jean Pierre Lucien Osty, was a French writer, journalist and war correspondent who rose to fame with his book The Centurions published in 1960. It was the first of two books which tackled the ‘new warfare’ of a post World War Two climate. By the 1950s war was being fought on very different fronts in places such as Algiers, Korea and Vietnam were guerrilla tactics and counterinsurgency replaced the huge tanks, aircraft carriers and outright bombing campaigns of the previous decade. Here now was a new world order in which the super powers of America, France and Britain were given a bloody lesson in combat by small, well trained and fiercely dedicated combat outfits who wreaked havoc and misery on ill-prepared troops oblivious to the strains of jungle or dessert warfare. 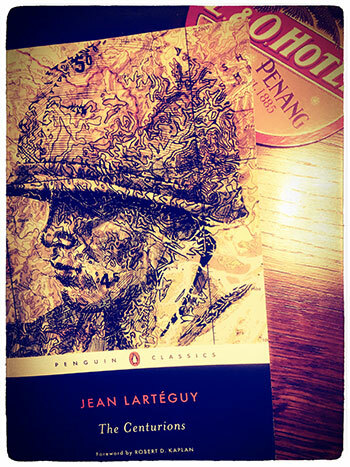 A decorated soldier who fought for France in Korea and North Africa for over seven years before becoming a war correspondent in the Middle East, South East Asia and Eastern Europe, Lartéguy brought a stunning sense of reality to his books which would be read by high ranking military officers in the American army as a study in guerrilla warfare. The Centurions was originally translated by Xan Fielding and gratefully republished by Penguin Classics. The vast majority of his work was published in French and his translated works are becoming increasingly difficult to find so once again we must thank Penguin for preserving such an important book. Having searched high and low for the sequel to no avail I am delighted to now be able to pre-order The Praetorians for release in June 2016, again, courtesy of Penguin Classics. This second volume is set in France and Algeria in 1958 and questions the actions of French paratroopers whose actions during the Algerian War were deemed immoral by others yet necessary by those soldiers frustrated at the casualties they suffered at the hands of the opposition. Translated once again by Xan Fielding it was and continues to be an immensely important book which resonates with todays conflicts across the Middle East, Afghanistan and Pakistan. So a Merry Christmas and Happy New Year to all of those who have stopped by Retroculturati, read and commented and to the people at Penguin who continue to inspire.